As a proud partner of the New England Patriots Alumni Club, Even Field is pleased to invite you to the 12th annual Game with the Greats. Even Field can help. We present tools and strategies to communicate, drive and reinforce a positive team culture that fosters high character and performance. We invite you to join Even Field at the Patriots Alumni's 10th annual Game with the Greats on Sunday, October 9th at Gillette Stadium. 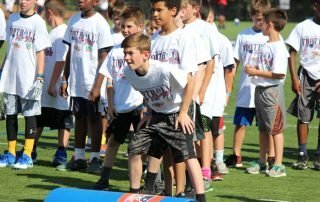 Photos from Football For You on May 21, 2016 at UMass Lowell's Cushing Field. Photos from Football For You on May 12, 2016 at Rocky Marciano Stadium in Brockton, MA. Photos from Football For You on April 23, 2016 at Gill Stadium in Manchester, NH. On December 11, 2015 Even Field led a panel discussion on sportsmanship at the RIIL's Student Sport Leaders Conference held at the Crowne Plaza Hotel in Warwick, RI. Join us at the New England Patriots Alumni Club's 9th Annual 'Game with the Greats' on Sunday, October 11th at Gillette Stadium. On August 16, 2015 Even Field presented to the student athletes of Cranston East and West at Cranston Stadium to kick off the 2015 Fall sports season. Photos from the RIIAAA Conference at North Kingstown High School on March 28, 2015. View the Photo Gallery on Flickr or click a thumbnail below to enlarge. On Monday, March 9, 2015 Chuck Wilson spoke to coaches of the Catholic Athletic League’s Volleyball program in Cranston, RI. On Wednesday, March 4, 2015 Chuck Wilson spoke to coaches of the Catholic Athletic League’s Soccer program in Cranston, RI. Join us at the New England Patriots Alumni Club's 8th Annual 'Game with the Greats' on Sunday, October 8th at Gillette Stadium. A local celebration to honor the International Day of Peace. The event included a walk through the community and guest speakers. We are pleased to be working with the Catholic Athletic League in Rhode Island this fall to help its young athletes to enjoy the best possible team sports experience. Thank You Beverly Youth Football & Cheerleading! We want to thank Dominic Copeland, his wife Shanin, and everyone involved with Beverly Youth Football and Cheerleading for welcoming us to your community last night. We had a wonderful evening and a great audience for our two presentations.